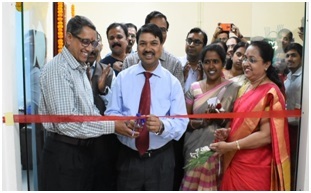 Mumbai Research Centre of ICAR-CIFT has established new additional facility of fish biochemistry laboratory which has two sections, one for instrumental facility and the other one for routine biochemical analysis. 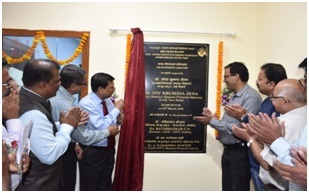 On 2 March, 2019, Dr. J.K. Jena, Deputy Director General (Fisheries Sciences), ICAR, New Delhi inaugurated the new facility by curtain raising and ribbon cutting. 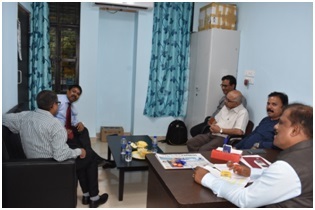 The meeting that followed begun with the traditional lamp lighting ceremony by Dr. Jena. Dr. L.N. Murthy, Scientist Incharge of the Centre delivered welcome address. Delivering the Presidential address, Dr. Ravishankar C.N., Director, ICAR-CIFT opined that with the extension of laboratory can have more consultancies, more HRD programmes and trainings and Scientists can work on species-specific and region-specific interventions related to seafood industry. Dr. Jena in his speech highlighted importance of fisheries in empowerment of fish farmers, fisherfolk and small, medium and large scale entrepreneurs. He also urged for need- based research, especially in harvest and post harvest sector in order to double the farmers income. 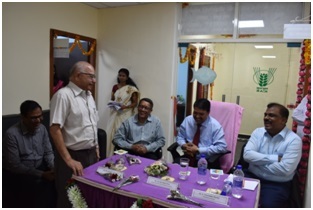 Felicitation address was given by Shri Rajakumar Naik, Deputy Director, MPEDA and Shri S.R. Kulkarni, seafood exporting industry representative from M/s Hirawati Seafood Exporting Company. Shri Sandeep Dongre, Secretary Seafood Exporters Association, Mumbai Chapter and The Director, M/s. Sanchita Marine Pvt. Ltd also graced the occasion. 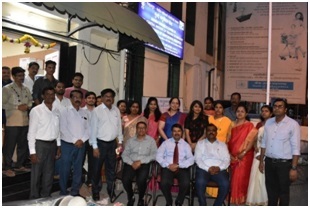 Engineers of CPWD who were instrumental in construction were invited in the function and they were honored with ponnada and momentoes by respected DDG. The meeting concluded with a vote of thanks by Dr. A. Jeyakumari, Scientist. 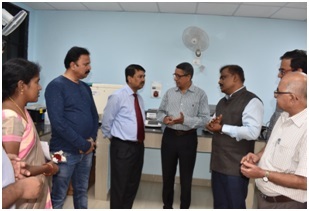 Later the Honorable DDG visited the new lab facility and interacted with scientists and all the staffs of Mumbai research centre.